Pure origin coffeeThere are 7 products. 0,21€ PER CAPSULE. 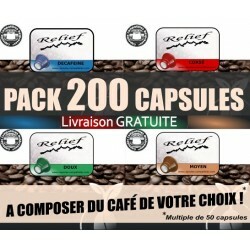 Batch of 400 Relief capsules Nespresso® compatible. Arrange your own composition of flavours within the four available aromas; Decaf, Low, Medium or High intensity.